On July 7, 1914, Dunn offered to trade Ruth, along with Ernie Shore and Ben Egan, to Connie Mack of the Philadelphia Athletics. Dunn asked $10,000 ($212,027 in current dollar terms) for the trio, but Mack refused the offer. The Cincinnati Reds, who had an agreement with the Orioles, also passed on Ruth. Instead, the team elected to take George Twombley and Claud Derrick. Two days later, on July 9, Dunn sold the trio to Joe Lannin and the Boston Red Sox. The amount of money exchanged in the transaction is disputed. Ruth spent only five months with the Orioles before he was sold to the Boston Red Sox. During three seasons in Boston, Ruth was primarily a pitcher. In his first World Series, he pitched 29 2/3rds scoreless innings, breaking Christy Mathewson's record and setting a mark that would stand for 43 years. The Red Sox won the World Series that year and again in 1918. In three regular seasons, Ruth had compiled a record of 94 wins and 46 losses, but despite his stellar performance as a pitcher, he was already developing a greater reputation as a hitter. He played some outfield and some first base during the 1918 season. 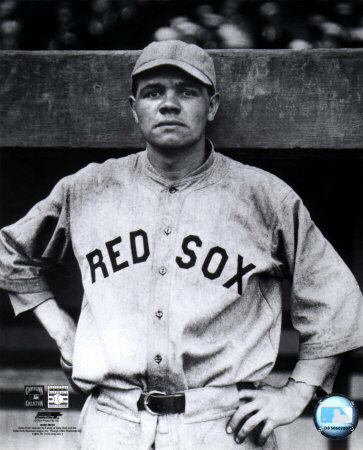 Playing exclusively outfield for the first time in 1919, he set the major league record with 29 home runs, but the Red Sox finished far behind in the pennant race. Ruth lived there until he was 19 in 1914, when he was signed as a pitcher by the Baltimore Orioles. That same summer, Ruth was sold to the Boston Red Sox. His teammates called him "Babe" for his naiveté, but his talent was already maturing. In his debut game against the Indians, the 19-year-old Ruth gave up just five hits over the first six innings. In the seventh, the Indians managed two runs on three singles and a sacrifice and Ruth was relieved. His hitting prowess, however, was not on display that first night--he went 0 for 2 at the plate.